I did it !! 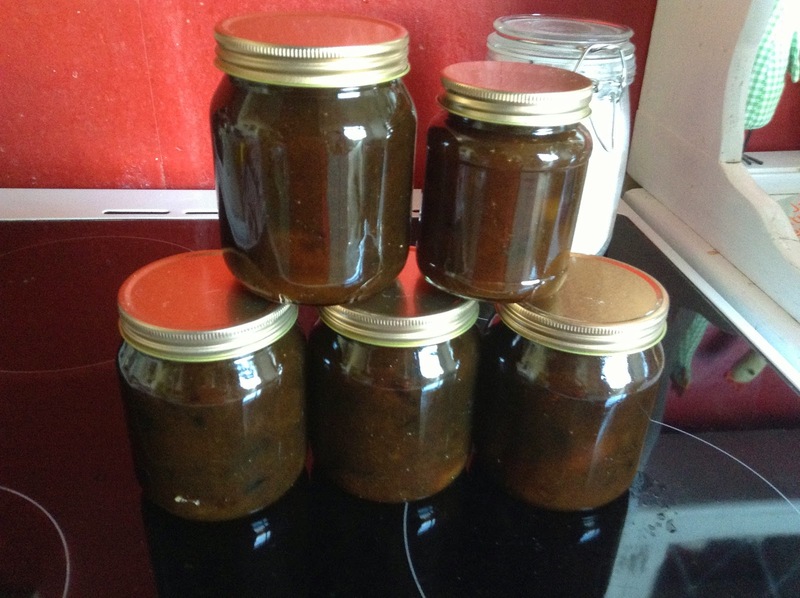 I made my Greengage Jam. The greengages are from last years stock, that I froze. One of my freezers is two thirds full of fruit from last year. So I do need to start making Jam so there is room for this years fruit. And because I have ran out of homemade jam. 15 g or 1/2 oz. 1. 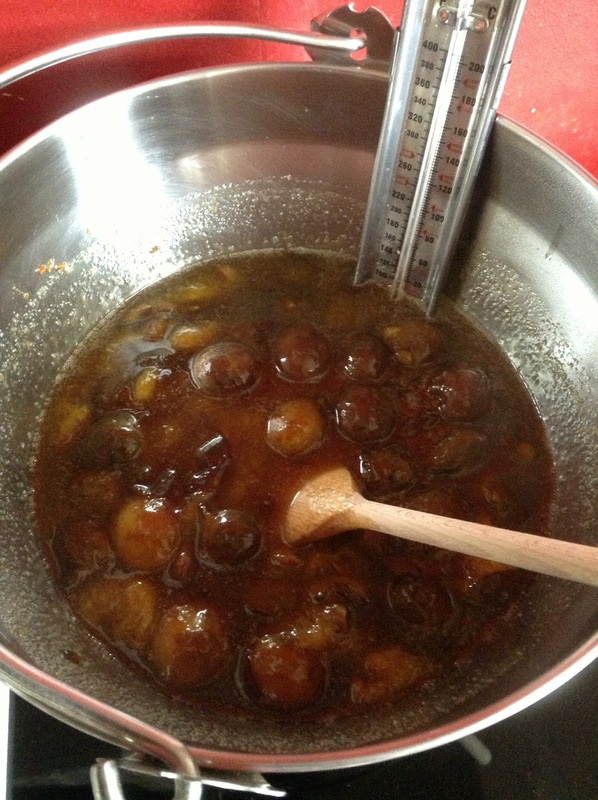 Put the whole greengages into a pan, ( tip; count how many go in because that is how many stones need to come out) with 250 ml of water and the vanilla pod. Simmer for 30 minutes until the fruit is extremely soft. Draw off the heat and add the sugar. Keep stirring until it has all dissolved, then return it to the heat. Bring it to the boil and stir in the butter. 2. Let it boil hard for 10 minutes, stir occasionally so it does not stick to the bottom. By this time the stones should be coming to the surface. Lift them out with a slotted spoon. 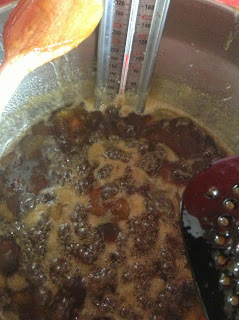 Keep boiling then jam until it reaches setting point. 3. Skim off any scum, and fish out the vanilla pod. ( keep this to one side.) Then ladle the jam into hot sterilised jars, seal, leave to cool and label. Now I am going to tell you how to make vanilla sugar, with the vanilla pod wipe it clean. Get an air tight jar and fill it half up with sugar, place the vanilla pod into the sugar, don't worry if its a little sticky add the remaining sugar and seal the jar. Leave for a week or two open the jar and smell the vanilla. You have just made your very own vanilla sugar. I do this all the time, then I use the sugar when I am making cakes and biscuits. My jam this time came out dark because my fruit is frozen, if you use fresh greengages the jam will be lighter, but it all tastes the same," delicious ". I love making jam because the last little bit in the pan I always have on hot toast there and then. 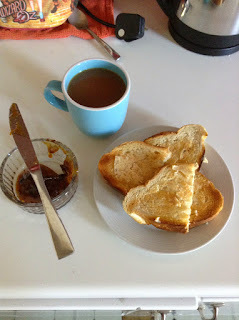 Once all the jarring up is done and before the washing up begins, I cook up some toast, make a cuppa and enjoy my freshly made still warm jam on my freshly made toast, it tastes divine. Hopefully next week I am going to make apple and blackberry jam. Thanks for stopping by.... enjoy making the jam its fun and tastes nice too..